Just Because Mixed Flowers You don't need a special occasion to send someone flowers to show them you care, sending flowers 'just because' often means all the more. At our online flower shop it is so easy to send flowers to someone special as we have an excellent flower delivery service. 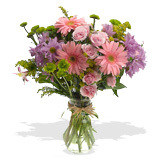 We send our flowers via FedEx so you can be guaranteed that your mixed flower bouquet arrives on the day you specified and in perfect condition.